I’ve been wanting to go on food adventures, but it’s been hard without a car. 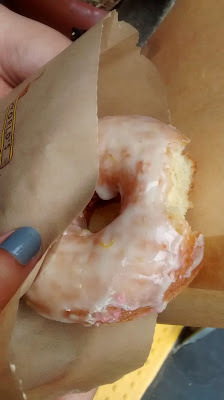 I finally mustered the fortitude to go on the bus ride and drag Megara and Tiana (I’ve changed their names to Disney princess names to reflect my burning desire to go to Disneyland) to Sidecar Doughnuts with me. The line was pretty long at 4pm. The girls were exclaiming about this, and I kind of have this feeling that they didn’t want to wait in the line, but I gave them no out. I wanted doughnuts, darn it. And anyways, the line wasn’t that long; it just looked long because the storefront is tiny and there were people sticking out the door. The selection was a bit bare, though they were making doughnuts the whole time, each batch in different stages of completion. There was a black velvet one with cream cheese frosting that was 5 minutes away because they just needed to get glazed, but the malasadas still had to cool and get filled with haupia. Tiana wanted a maple bacon and I wanted a huckleberry, but both required waiting times of at least 10 minutes. We were impatient, so we went with what was out- Tiana got a meyer lemon and I a cinnamon crumb. Megara got a lemon too and I wanted to shake some sense into her. Why are you getting the same thing?? Then I can’t try as many. Oh gosh I hope my future partner likes sharing food. I offered to share my doughnut with them, but they both declined. Luckily Tiana let me have a bit of hers. I knew there was a reason she was my favorite. First: let me say that the doughnuts were so fresh and warm. Mmm. 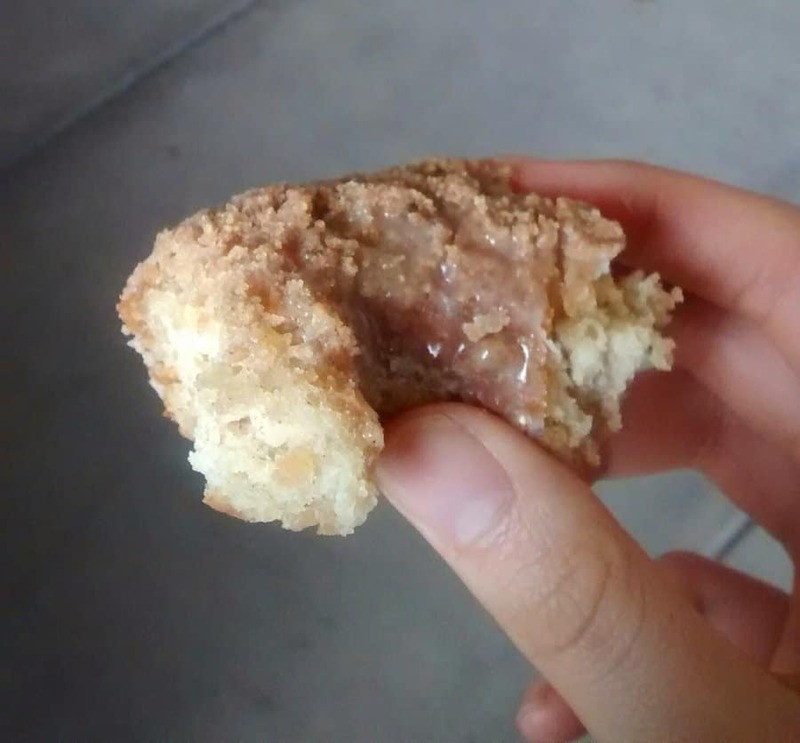 The cinnamon crumb was kind of like a cinnamon sugar doughnut, but the cinnamon sugar was buttery and packed onto the doughnut like the best streusel you’ve ever had. The lemon was a bit tangy, though I wish it has more of a lemony oomph. Both were super fluffy and moist, and the textures were some of the best I’ve ever had in a doughnut. These were great, to be sure. They’re kind of like a middle road between your average doughnut haunt and the glory that is Doughnut Plant in NYC. However, I feel like I need to go back again. There’s so many flavors I haven’t tried that I would love to. And this time I’ll visit with people who will all 1) get different doughnuts and 2) share with me.